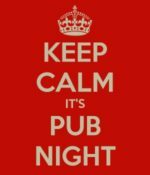 Come enjoy our weekly pub night, full of deep conversation, fellowship and fun! You’ve read about it, you’ve heard about it, now come out and experience it for yourself. Pub Night is a night of great conversation and fellowship at one of Calgary’s most iconic pubs. The menu is very inclusive, complete with gluten free and vegetarian options. Pub Nights are held on the first Wednesday of every month.